Shop our unique Dachshund Gifts – you're sure to find something special for yourself or the Dachshund lover in your life. All of our Dachshund merchandise is made in our Northern California Studio, using our original artwork and handmade pottery. The results are items that you will be proud to own or give, with the added benefits of being made with care and joy, in America. You will find Dachshund mugs, wine stoppers, dipping bowls, treat jars, sugar bowls, creamers, and more. It is important that your Dachshund items reflect your dog, or the gift recipients dog. At this time we offer two color varieties for our smooth haired Dachshund design: red, and black and tan. If you desire a different coat color, you can use the "custom" option and have your Dachshund gifts personalized to better match your dog's colors and markings (there is a small art fee for this option). If you are looking for a different Dachshund coat type, then contact us and we can add it to our design schedule. Our Dachshund Merchandise conveys a Mediterranean style, with a cute Dachshund surrounded by a colorful floral pattern, accented with hand painted cobalt blue and golden yellow. While our Dachshund pottery may look like it requires special handling, it's actulaly quite tough, like the little dog it celebrates. We encourage you to use your Dachshund items daily, and microwave and dish-wash them to your heart's content. Because our items are made of stoneware, they are very durable. And the artwork, which is applied via decals (also made in-house), become a part of the glaze surface during the final firing, so you need not worry about fading with use or washing. The Dachshund is one of the most recognizable dog breeds the world over. Who didn't have a Slinky Dog as a kid or at least love the Character in Toy Story? The long, low-to-the-ground body, floppy ears, and brash personality make the Dachshund quite a character and amenable to cartoons, hot dog commercials and the like (who can forget Heinz Weiner stampede commercial during the 2016 Superbowl?). The Dachshund originated in Germany, developed by German foresters to track game, and to follow those animals that retreated to the safety of their own burrows. However, with this tough little dog after them, foxes and badgers were no longer safe in their burrows. Think about the courage it takes to go into a dark hole and face an animal in it's own territory – this explains the Dachshunds very feisty personality. 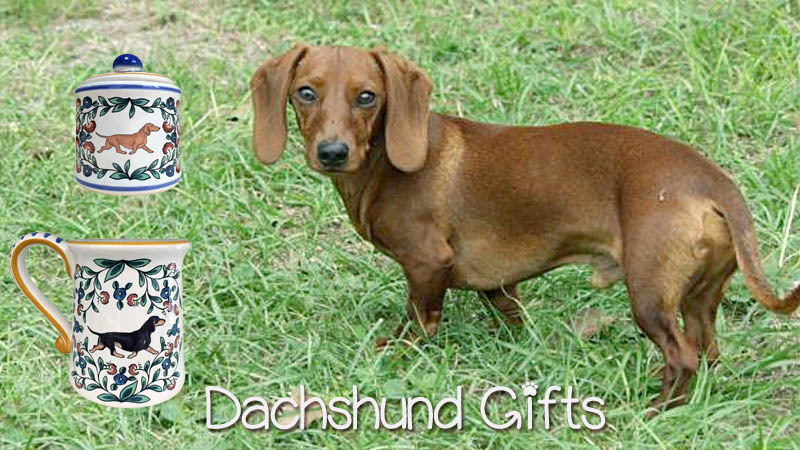 We are very happy to celebrate the plucky Dachshund with our one-of-a-kind Dachshund Gifts.